Forget about those brightly colored rainbow donuts from Brooklyn that came hot off the heels of the rainbow bagel phenomenon (also in Brooklyn). The rainbow donuts you need to know about are actually in Jersey, and they mark a return to a beloved, old-school Italian dessert. Jule Hazou, the owner of Glaze Donuts in New Milford, NJ was inspired to make the Italian Rainbow Donut because the Italian Rainbow Cookie (almond-based sponge cake made with jam and chocolate) was his daughter's favorite dessert. The process to make the Italian Rainbow Donut is so time-consuming and detailed that Hazou decided to only make them for available for the weekend. He makes between 400-500 on each weekend day and they usually sell out before noon. 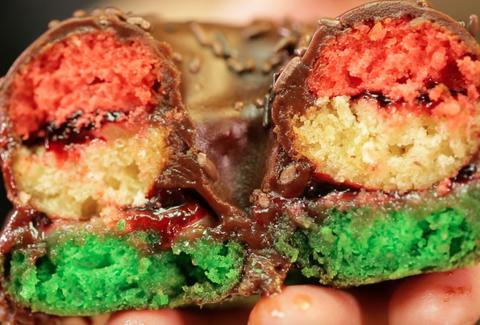 Find out more about how the Italian Rainbow Donut is made in the video below.